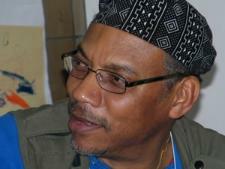 VONA Voices Writing Workshop and the University of Miami's MFA in Creative Writing Program announces the return of the VONA/Voices regional writing workshop, at the University of Miami (UM), January 18-20, 2013. "Miami, as a location and an environment, reflects the spirit of the VONA/Voices Workshops with its diversity and sense of communities," says Diem Jones, executive director of VONA. "We are very excited to return to the University of Miami." The Voices of our Nations Arts Foundation (VONA) is dedicated to nurturing writers of color and has been holding summer workshops for twelve years in the Bay Area. The success of last year's workshop, held over the Martin Luther King, Jr. Birthday weekend, has inspired another year of offerings in Miami, where culture and arts converge both off and on the UM campus. M. Evelina Galang, director of Creative Writing at the University of Miami, approached Jones about the workshops in Miami after her first stint as faculty in the summer workshops. "As a VONA/Voices instructor during the summer, it's always a great joy to be with students so hungry and willing to learn and do the work. These tough young writers go into deep territory, sometimes lost and sometimes stuck, but always willing to move," Galang says. The writers offer stories to each other that present a narrative representation of a story of family, culture, place, and situation. These portrayals whether fact or fiction have a dynamic life in the narrative. The participants exchange their work and share their ideas. Writers share strategies for researching and producing emotionally true memoirs. Writers exchange and evaluate each other's works. Acknowledging the traditions of written, spoken, drummed, danced and signed poem, the poets in this class develop their works with a consciousness of their place in the Diaspora, the anxiety of identity and the demand of the public voice. The participants exchange their work and share their ideas. Writers meet one-on-one with Galang for intensive manuscript feedback. During lunch hours we gather as a residency group to discuss the published works of writers of color and to explore the expectations, roles, pressures and responsibilities writers hold for themselves and their communities. When we are not in conference or in lunch meetings, writers are expected to write, revise and draft their creative pieces. Workshops begin Friday, January 18, 2013 and end with a participant writer reading on Sunday, January 20, 2013. Writers in the workshops will exchange their work, discuss craft and strategy, generate new writing, and develop writing communities. All writers of color are encouraged to apply. VONA/Voices encourages the world of writers, from those just exploring their voice to writers with projects in progress. The three workshops will be limited to 10 to 12 writers and will meet Friday through Sunday, from 9am-12:30pm and 2:30pm-5pm. A faculty reading, which is open to the public, will be held on Saturday night at Books & Books in Coral Gables. The workshop participants will present their work on Sunday night. Applicants will be able to apply online beginning September 15, 2012. The application deadline is November 5; selection notifications will be completed by November 15, 2012. Tuition for the weekend is $550; a special rate at the Holiday Inn by the UM campus is available to participants. Established in 1999, Voices of Our Nations Arts Foundation has presented the Voices Writing Workshops at the University of San Francisco and UC Berkeley for 13 consecutive years. 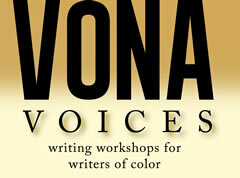 The VONA Voices Writing Workshop is dedicated to nurturing developing writers of color. Each year nearly 140 writers come from around the country and around the globe to work with renowned writers of color. As the only Multi-genre workshop for writers of color in the nation, VONA provides developing writers a place where they can explore their craft in an atmosphere of support and understanding, where they can exchange with great writers ideas and inspirations, where they can gain empowerment to move from VONA to a writer's life with authority and confidence. The University of Miami MFA in Creative Writing warmly welcomes the VONA/Voices community for this special weekend of workshops. Follow the Apply link (www.surveymonkey.com/s/vonamiami2013) to the application form and answer all the questions. Once you begin the application, you can't save it and return, so read it through before you begin. Send the $25. non-refundable application fee. The application is due: November 5, 2012.
once accepted, send in a $100 non-refundable deposit to secure your space by December 1. The tuition balance is due December 15. Total Tuition for the weekend is $550. All checks are made to the University of Miami. When you are accepted, you will receive information on our special room rate at the Holiday Inn right across from campus.